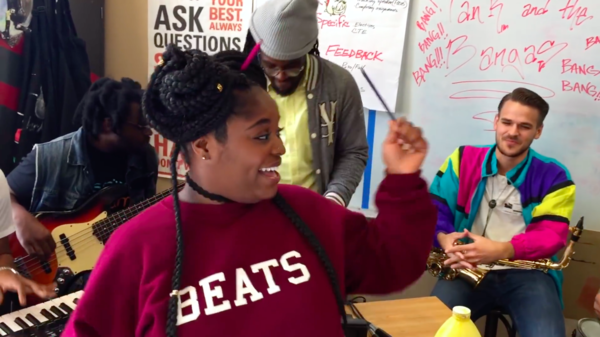 Tank and the Bangas in a still from their Tiny Desk Contest-winning entry video, "Quick." We watched more than 6,000 videos. Ten judges weighed in. Now, the 2017 Tiny Desk Contest has a winner. We are proud to have fallen in love with the sounds of New Orleans' own Tank and the Bangas. What won me over about the band's performance of "Quick" were the interactions among lead singer Tarriona "Tank" Ball and her bandmates, and the way they seemed to surprise one another. It all felt so organic and on-the-spot, just like the best Tiny Desk concerts. The other judges were equally impressed. Stas THEE Boss, a hip-hop DJ at NPR Member station KEXP and a former member of THEESatisfaction, says, "Tank and the Bangas gave me life straight out of the gate." Fellow judge Rita Houston of Member station WFUV says, simply, "There is star power all over this." In this third year of the Tiny Desk Contest, we got more submissions than ever before. We saw submissions from every state in this country, and the variety of ages and instrumentations on display was thrilling to see. There may be only one "winner," but truth be told, every one of these videos is a testament to the joy of making music. It's a way to share what is often so personal, publicly. It's about a community of friends and sharing your art with a world beyond your bedroom. So from all of us at the Tiny Desk, thank you to everyone who submitted. Thank you for all the chances you took in putting yourself out there. Our next step is to have Tank and the Bangas come and record a Tiny Desk concert here behind my desk at NPR in Washington, D.C. And after that, we're hitting the road with Lagunitas Brewing Company on a national tour with Tank and the Bangas and local Contest entrants we loved. Stay tuned for dates and more information — we can't wait to meet you in person. There will be more opportunities for us to feature some of the amazing music you shared with us, and I already know I'll be spending a good deal more time listening to so many of the artists who entered. But for now, I want to thank everyone who entered the Contest for inspiring our team every day. And to Tank and the Bangas: Congratulations. Our adventure together is just beginning. OK. Tiny Desk Concerts - some of you probably know exactly what I'm talking about. For those who don't, this is a popular video series on the NPR Music website. Musicians will just drop by NPR headquarters in Washington. NPR Music films them playing a short, stripped-down set with literally people working at their desks around them. And some pretty big stars have done this. ADELE: (Singing) We could have had it all, rolling in the deep. GREENE: Yeah, that's Adele. She just dropped by our office. Now, for the third year in a row, we are giving undiscovered musicians a chance, and we're calling this the Tiny Desk Contest. We asked unsigned artists around the country to submit a video of themselves performing in front of a desk of their choice. 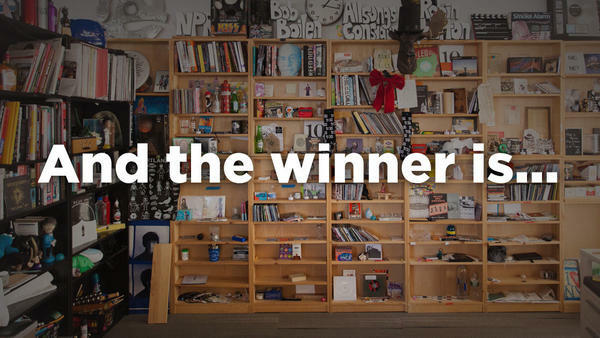 The winner gets a chance to perform in front of the real tiny desk. The submissions are in for this third year. And today, we're ready to announce the winner. And here to help with this is the guy who came up with this whole idea, Bob Boilen, co-host of All Songs Considered. BOB BOILEN, BYLINE: Hello there. GREENE: And you've brought along one of your judges, Trey Anastasio, the singer and guitarist from the band Phish. GREENE: Bob, how many people entered this year? BOILEN: More than ever - we had over 6,000 entries. It's eye-glazing. GREENE: That's a lot to go through. BOILEN: It's a lot of video. GREENE: Lots of pressure on the judges. So Trey, I mean, you're a musician. You spend a lot of time looking at other bands, listening. Did anything make this experience as a judge unique? ANASTASIO: Definitely. My favorite part was that the people make their videos in their bedrooms, in their living rooms - it's very personal. And there was all styles of music at the same time - so there's country; there was electronic music; there's hip-hop. And you got, like, a picture of what's going on in America right now. GREENE: Well, let's hear the one that you guys fell most madly in love with. Bob, you want to bring up the winning song? BOILEN: The winning video is by a group called Tank and the Bangas. GREENE: Oh, I like that - like, bangas is like bangers but bangas? TANK AND THE BANGAS: (Rapping) Down by the river where the green grass grow, the sun be burning, burning hot. TANK AND THE BANGAS: (Rapping) ...Nobody know where you go, just know the block just got hot. GREENE: All right, Bob, I'm watching, it looks like, a group in a classroom - really happy, full of energy. And the lead singer here is reading from a - from some sort of book. What's happening? And who are they? BOILEN: The group Tank and the Bangas are from New Orleans. They are in an art classroom in New Orleans. They wanted a big desk that they get to all set up on. They put the keyboards there. They put a drum pad machine. It's a six-piece band here. GREENE: Well, this group is just full of energy. Trey, what stood out for you? ANASTASIO: Well, I immediately loved this. This was a clear winner for me. And Tank is like a force of nature. GREENE: ...Front and center in the camera? OK.
ANASTASIO: Just full of joy. And her band is killing in the background. TANK AND THE BANGAS: (Singing) Sipping on that sizzurp, I was leaning and rocking. (Rapping, unintelligible). BOILEN: The interactions they have and the way they surprise one another - it just was organic and on the spot. I think that's what was winning for me. What about you, Trey? ANASTASIO: I agree. And that New Orleans thing - you know, I did kind of think, when I was watching them, of that joy from, you know, Professor Longhair right on through The Meters and its funkiness. But it's so 2017 with Tank and the Bangas. It's clearly, like, a vocabulary that's sort of hip-hop in there too. They're great. GREENE: This is just a taste for our listeners. Tank and the Bangas - they have won this year's Tiny Desk Contest. And they are going to be interviewed tonight on ALL THINGS CONSIDERED, so don't miss that. Bob Boilen from All Songs Considered and Trey Anastasio from Phish - singer and guitarist for that group that we all know and love - thank you guys. BOILEN: My pleasure. Yeah, yeah. TANK AND THE BANGAS: (Singing) I see him looking a mile... Transcript provided by NPR, Copyright NPR.